← How did I increase my portfolio 10 times in 3 years using modified covered call (MCC)? Commentary: The stock market kicked off 2012 with a gap higher, extending the rally that occurred in late December. While the markets gapped higher on Tuesday as traders returned from the holidays, they closed weakly and spent a couple of days digesting the gains. Friday saw the markets gapping higher again on a better than expected unemployment report which was faded right at the start. The markets did finish close to their highs for the week though, despite the lackluster intraday action. 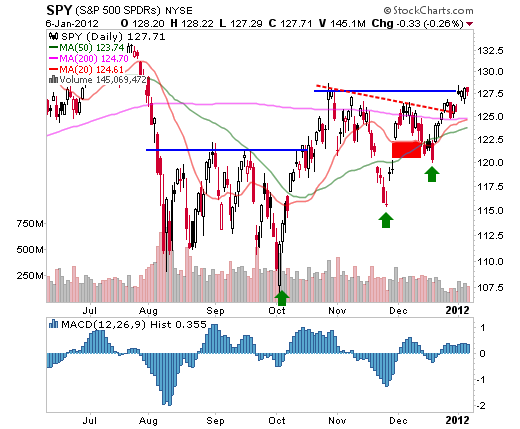 If the markets can quietly consolidate in this area, it could set the stage for a push higher in the coming weeks. The DJ Industrial Average as represented by the Diamonds Trust, Series 1 (NYSE:DIA) ETF actually cleared its October highs already and could be acting as a leading indicator. While DIA is comprised of only 30 stocks and can be influenced by a move in only a few stocks, the fact that it is already close to last years highs is very positive. Traders should keep an eye on the $122 in case DIA pulls back as this level should attract buyers. 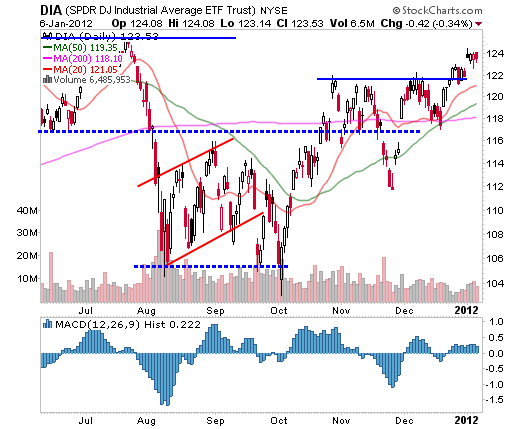 However, if DIA continues to act well, it could challenge last years highs in short order. 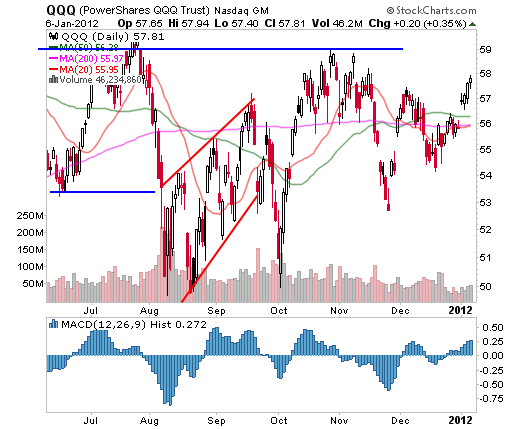 The Nasdaq 100 as represented the Powershares QQQ ETF (Nasdaq:QQQ) ETF actually had a very good start to the year. While it also suffered from a lackluster close after its gap on Tuesday, it had a decent follow through the rest of the week as it closed higher every single day. QQQ ended the week solidly in the green and cleared its December highs. It also failed to fill its open gap which was a nice display of strength. It is a positive sign that QQQ is resuming its role as a leader, and it is actually still pretty close to all time highs. If QQQ can continue to lead the way, it would bode well for the rest of the markets. While the smallcaps as represented by the iShares Russell 2000 Index (NYSE:IWM) ETF didn’t fare as well as QQQ, the index ETF did finish higher for the week. IWM is still technically underperforming its peers, as it remains the only one of the four index ETF’s still below its 200-day moving average. Smallcaps typically outperform early in the year, so traders should keep a close eye on how they perform relative to the other index ETF’s. If the market is truly healthy, then this group should start gradually performing better than DIA and SPY at a minimum. This weeks highs are the first level to keep an eye on, as IWM failed to approach it after the gap on Tuesday. 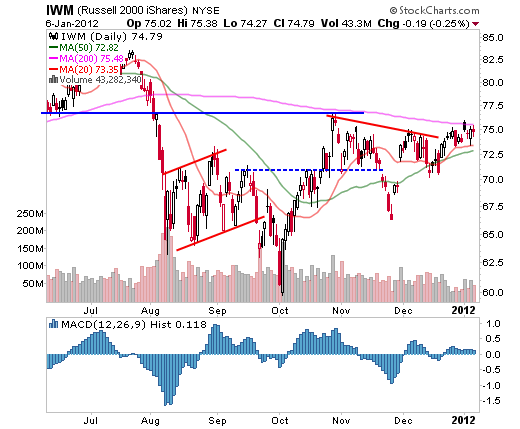 IF IWM can close above this level, it should set the stage for a push into the high $70’s. Find Chart Advisor Useful?Check out our other FREE newsletters! Joey Fundora is an independent trader located in South Florida. Joey focuses on using technical analysis techniques to uncover supply and demand imbalances in equities. To see more of his work, visit his site on Stock Chart Analysis. At the time of writing Joey Fundora did not own shares in any of the companies mentioned in this article. ChartAdvisor is not a registered Investment Adviser or a Broker/Dealer. The trading of securities may not be suitable for all potential users of the Service. You should be aware of the risks inherent in the stock market. Past performance does not guarantee or imply future success. You cannot assume that profits or gains will be realized. The purchase of securities discussed by the Service may result in the loss of some or all of any investment made. We recommend that you consult a stockbroker or financial advisor before buying or selling securities, or making any investment decisions. You assume the entire cost and risk of any investing and/or trading you choose to undertake. Richard Cheng, M.D., Ph.D., is an avid Wall Street investor with 20+ years of investing experience. He is specially adept at observing the world to find the patterns and then design strategies to win his battle. Most, if not all, happenings in the world, follow certain patterns. These patterns may be complex, multi-factorial, not so intuitive at the first glance, or even may appear chaotic. However, even chaos has its own patterns. If you pay attention and be patient, you'll find them and then you will gain an upper hand in your battle. Using this blog space, he documents his trades and his thoughts as they happen. He uses this blog as a a notebook to help him better refine his strategies. Hopefully this will help you as well. Good luck in your trading.